<h1><strong>Engineered Physical Vapor Deposition Coatings</strong></h1> <img class="alignnone size-medium wp-image-11" src="http://crystallumepvd.com/wp-content/uploads/2017/03/PVD_head-300x125.gif" alt="" width="300" height="125" /> <p style="text-align: left;">Crystallume specializes in PVD coatings for functional applications. Our coating expertise covers the range of materials from aluminum to high speed steel to tungsten carbide and applications from tooling to automotive to medical. The coatings we offer are listed below:</p> <table style="width: 350px; height: 252px;" cellspacing="20" cellpadding="20" bgcolor="#FFFFFF"> <tbody> <tr> <td style="background-color: #ffcc00;"><center><strong>Infinium T</strong></center></td> <td style="background-color: #cccccc;"><center>Titanium Nitride</center></td> </tr> <tr> <td style="background-color: #ffcc00;"><center><b>Infinium C</b></center></td> <td style="background-color: #cccccc;"><center>Titanium Carbonitride</center></td> </tr> <tr> <td style="background-color: #ffcc00;"><center><b>Infinium E</b></center></td> <td style="background-color: #cccccc;"><center>Chromium Nitride</center></td> </tr> <tr> <td style="background-color: #ffcc00;"><center><b>Infinium A</b></center></td> <td style="background-color: #cccccc;"><center>Aluminum Titanium Nitride</center></td> </tr> <tr> <td style="background-color: #ffcc00;"><center><b>Infinium Z</b></center></td> <td style="background-color: #cccccc;"><center>Zirconium Nitride</center></td> </tr> <tr> <td style="background-color: #ffcc00;"><center><b>DLC</b></center></td> <td style="background-color: #cccccc;"><center>Hard Carbon Coating</center></td> </tr> </tbody> </table> Crystallume was founded in 1984 to develop CVD (Chemical Vapor Deposition) diamond coatings for various marketplace applications. Diamond coatings and free standing films for tooling, electronic and optical applications were investigated. 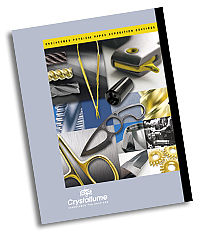 In 1999, Crystallume was purchased by <a href="http://www.robbjack.com/">RobbJack Corporation</a> and narrowed its focus to diamond coatings for tooling applications. As a result of this focus, Crystallume has become the world leader in this area, especially when good uniformity and tight tolerances are required. In 2002, Crystallume decided to enter the <a href="http://crystallumepvd.com/infinium-coatings">PVD</a> (Physical Vapor Deposition) coatings market in order to expand its capabilities. Crystallume's parent company required state -of-the-art coatings for its world-class carbide cutting tools. Thus, a world-class coating center was created using the best hard coating technology available. Crystallume was founded in 1984 to develop CVD (Chemical Vapor Deposition) diamond coatings for various marketplace applications. Diamond coatings and free standing films for tooling, electronic and optical applications were investigated. In 1999, Crystallume was purchased by RobbJack Corporation and narrowed its focus to diamond coatings for tooling applications. As a result of this focus, Crystallume has become the world leader in this area, especially when good uniformity and tight tolerances are required. In 2002, Crystallume decided to enter the PVD (Physical Vapor Deposition) coatings market in order to expand its capabilities. Crystallume’s parent company required state -of-the-art coatings for its world-class carbide cutting tools. Thus, a world-class coating center was created using the best hard coating technology available.